As we know, The Lion King is a Disney animation film. It was launched one year after I was born. My father shows me this film when I was a little kid, maybe six or seven years old. Until now, no other animations could defeat this. 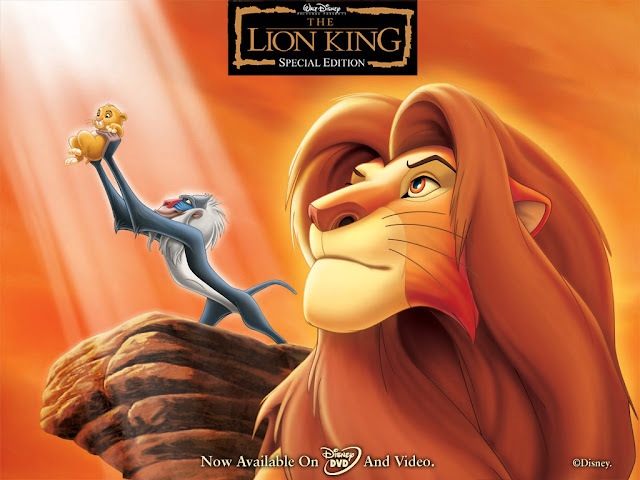 I think The Lion King has some magic in it that can make people who watch this film hypnotized by the story and the soundtrack itself. The great story, the great soundtrack and the great meaning of the film support The Lion King to become a perfect animation of all time. The Lion King has story about Lion that rule the jungle, his name is Mufasa. He has a little lion named Simba which will be a king when he grows up. However, the antagonist of the film is still in the family of the lion. He is brother of Mufasa, Scar. Scar wants to be a king, so he tries everything bad to be a king. You can watch it if you curious. But if you know the story, you may agree with me that the story is really touching. Honestly, I always cry when I watch the scenes that Mufasa died and when Simba can hold her throne again, and walk through the stone into the light. It is really amazing. Beside the story, the film is supported by a great soundtrack. The soundtrack is fit with the situation and the mood of the film. The music can bring us as the audiences into the film. Therefore, we can exactly know what happens and what the characters feel. This is also make the scene looks so epic. I think the best decision that Disney makes is making this film a musical. Therefore, the dark side of the story can be manipulated by the songs and the music. Over all, I love all tracks in the film. Beside from the story and the soundtrack, Lion King has a great meaning behind them. Every story must have meaning, but this story has a lot of meaning, not only for children but also for adult. The story taught us to be wise as Mufasa and brave as Simba. Even though you have a terrible past, you should face it, not run from it. Be responsible and confident when you are right. I have plan that if I have a child someday, I will show this film to my child so that they can be brave and wise as the Lions in that film. I love this film, and I want everybody to watch it. Even though this is an old film, but this film has deeply meaning that more important for kids to know. Therefore, I have and will love this film forever. Try to watch this movie again, and you will realize that the story is just great and epic. Once I have read that this movie is inspired by the tales of Joseph and Moses and Hamlet which is written by Shakespeare. Yup, Tom and Jerry also is my favorite animations. Not strange that the film still airing until now.